Search Engines are generally the first choice for getting information. As a result it can provide millions of search results for essentially any inquiry you may have, which is great; unless the flood of results hinder your ability to find exactly what you are looking for. Scrolling through page after page of “half matches” can be very tedious and time consuming. What can you do to use search engines efficiently? By being more specific with exactly what you are looking for, you can direct the search results to only show you what you need and significantly reduce irrelevant results. Let’s say I want to learn how to tie a tie. When I go to Google and type how to tie a tie into the search bar, Google brings up 408,000,000 search results and many different options such as Double Windsor, Half Windsor, bowties, etc. My tie is a necktie, so I want to get rid of all searches that have to do with bowties. Beside my search I type “-bowties”, now all I see is results for tying a necktie. Even with the elimination of bowties, I have many results to choose from. So now I’m going to decide what kind of knot I want to tie. 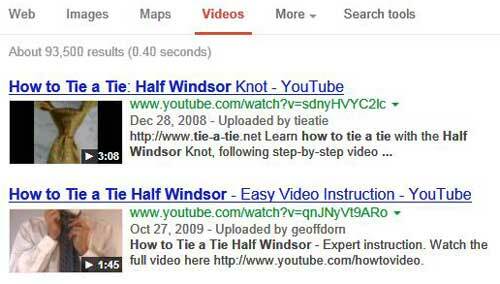 I’m looking to tie a Half Windsor Knot, so I will add “Half Windsor” to my search. Now, not only am I down to 89,500 results, but I can see diagrams, videos, websites and “more” all specifically geared toward tying a Half Windsor Knot. It’s best to use direct keywords when using quotation searches because Google will only look for the exact phrase, order and spelling that you type between the quotes. Looking at my results, I think that a video tutorial will best help me learn how to tie this knot. Directly underneath the search bar there are options for different categories of the types of results I could be searching for i.e. maps, news, images, videos and more. As I mentioned earlier, I want to view a video on how to tie a Half Windsor Knot, so by clicking the videos category, I only see video results of my search criteria. By modifying your everyday searches to be more specific you can increase your search productivity and find exactly what you are looking for. These search tips also work with other major search engines such as Bing, Yahoo! and YouTube.